In my continuing (and intermittent) efforts to catch up the Reds' offseason, here's a discussion of their biggest-profile trade. The Reds' acquisition of Mat Latos was arguably the biggest move of GM Walt Jocketty's tenure with the Reds. In exchange for two top-tier prospects, a relief prospect, and a struggling big-league pitcher, the Reds acquired an established, young, big league starter with high upside and many years of control left on his contract. It was a huge trade, and one that paid immediate dividends for the Reds. Latos had two excellent seasons for the Reds before last year's injury-limited season, and was a major part of the Reds' 2012 division champion team. 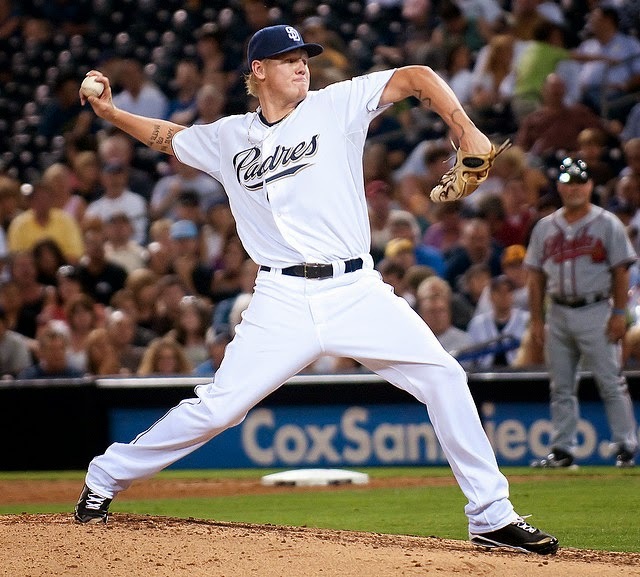 The 2012-2013 Latos is still the guy that I think about when I hear his name. As a result, it was with a sense of dread when I heard he was traded. I knew the issue: he had one year left on his contract, and there was little indication that the Reds would be able to re-sign him. Nevertheless, it seemed like a major blow to the team. Lato's strikeout rate took a big hit last year. So did his ground ball rate. And Steamer seems to have noticed, projecting him for what would easily be the worst season of his career. Now, one might be surprised to see a projection system react so strongly to one bad year. Steamer, however, uses fastball velocity in its projections, and Latos was throwing 2 mph lower last season compared to the previous years of his career. Steamer is worried, and probably for good reason. Latos might bounce back, of course, and would be a terrific asset for the Marlins as they try to compete with the uber-rotation Nationals. He had a number of relatively minor injuries last year that prevented him from having a normal spring training and might have sapped his strength and flexibility in a temporary fashion. But it could also be that he won't return to form, in which case he is suddenly a back-end starter. Despite all of that uncertainty, the Reds flipped his last year of control for a pair of players who have some promise. Let's take a look! DeSclafani (which I am struggling mightily to spell correctly) was a 6th-round selection out of the University of Florida, and Miami acquired him in the Jose Reyes/Mark Buerhle trade prior to the 2013 season. He has never been a top-tier prospect, but he has steadily advanced through the Marlins' system, and split time between AA, AAA, and MLB last year. He's shown a decent strikeout rate, (usually) excellent walk rates, and acceptable home run rates throughout his career. He only threw 33 innings last year in the majors, but so I'm not at all concerned about the ugly ERA. I'm actually quite encouraged by the strong walk rate and the effective strikeout rate, though I am arching my eyebrow a bit at his ground ball rate. The main caveat I have is that a chunk of those innings came in relief, which might inflate those rates. Still, as a toe-dip in the majors, one can do a lot worse. We have a clear separation between his four-seam fastball and his sinker, which both sat at the high end of where Kiley had him velocity-wise. Nothing here was identified as a curve, although it's possible that some of the "sliders" above could be a hard curve ball, while the cutters could be what McDaniel described as a slider. If the slider is his best breaking pitch, however, that would be surprising, because he threw the "cutter" fewer times than the "slider." So, we have some inconsistency. We'll just have to wait and see! At the minimum, it looks like the Reds acquired a mlb-ready #5 starter. Hopefully he can be more of a #3 or #4. Given the risk and short term control inherent in Latos, that strikes me as a pretty nice return. Wallach was a 5th-round selection out of California State-Fullerton. While 5th round is nothing to sneeze at, he hasn't highlighted a lot of top-prospect lists that I've seen. Nevertheless, he had a really nice season last year, largely at the Marlin's low-A affiliate. I'm particularly excited by the fact that he showed both superb walk rates and superb strikeout rates, walking far more often than he struck out. That's really good performance. He didn't show a ton of power, but a catcher with good on-base skills can be mighty valuable if he can field his position well. As throw-ins go, from a stathead perspective at least, he's a good one. This isn't the clear steal that the Alfredo Simon trade seemed to be. But given the high risk that Latos presents as he enters the season, I doubt the Reds could have done much better. Latos suffered a big drop in his apparent stuff last season, and is coming off of injuries to both his throwing arm and his legs. That, combined with his impending free agency unquestionably hurts his value quite a bit. With this trade, the Reds cleared up some payroll, replaced Latos in the rotation, and gained years of low-cost control. 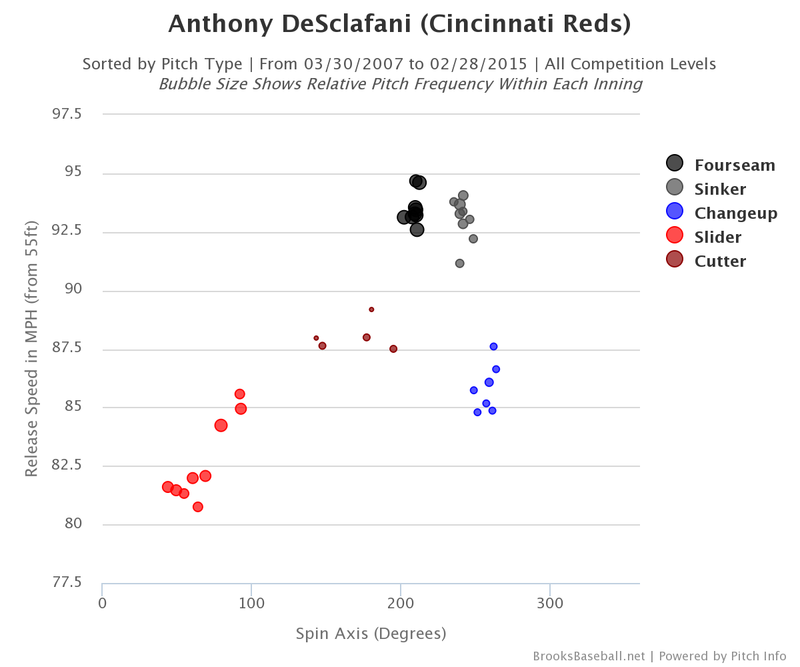 If DeSclafani is a serviceable cog at the back of the Reds' rotation for the next few season, the Reds did well in this deal.